When I was twelve I started karate and shortly after my first lesson I remember watching a documentary of Bruce Lee where he talked about Kung Fu and Karate. He said Karate was like being hit by an iron bar… "WHACK" as he mimed using an iron bar to hit someone. "However," he continued "Kung Fu is like being hit by an iron bar attached to a chain" and then he made a noise only Bruce Lee could make, as he mimed the snap of the bar and chain combination… "I wish I did Kung Fu" I thought! Twenty years later I have come to realise that maybe Bruce Lee didn't know everything there was to know about karate. However, I have forgiven him as I have seen many karateka who have also fail to see the snap of karate. Please try this: Make a fist and then hold your index finger up, straight. Now, as quick as you can bring the finger back down to the fist. Now return the finger back to the same place, but with your other hand pull the finger back as far as it will go and then release. Hopefully there will be a difference. With the first exercise the finger is being forced forward by the tension of the muscles. With the second exercise, it is the other hand that is forcing the finger back and when it is released it snaps back. However, because the muscles in the moving finger are relaxed, it moves twice the distance of the previous exercise in less time. This "snap" of the finger can demonstrate how we should snap all our techniques. Let me first talk about what I see is inefficient about the way that many people do karate. For the sake of simplicity I am going to refer to this as the "western" style of karate. However, let me assure you, I trained for many years in Japan and I have seen many karateka there do techniques in a similar fashion. However, this style seems to be more prominent in the west and therefore I will refer to it as the "western" style. And that style is tense and stiff, with movements of the arms being forced into place as techniques are executed. If we take the example of the simple gedan bari, people often execute this block in two movements. As they start to move forward from the simple yoi position, they bring their arm up so the blocking hand is to the side of their face. That position is then locked as they step forward. As they land, they force their arm/hand down to the blocking position. From the still relaxed yoi position, the arm is constantly tense throughout the movement. Even when they land the arm remains tense as it is forced into place. However, this is how beginners learn the techniques, but I have seen high dan grades do the technique in a similar, stifled, stiff manner. In order to maintain that locked, prepared position as you moves forward, you have to tense your muscles. With tense muscles, you are probably able to get your fist up as far as your ear, but no farther. However, this tension causes a blockage of the body's natural power. Then, as the block is executed, the arm is still tense. In the short term it may feel strong, but tension of any muscle makes movement slow and slow movement reduces the power and effectiveness of a technique. However, the "Japanese" style is much more relaxed and so much stronger and faster. We have all been on a course taught by instructors who seem to glide across the floor with so much speed and control and then deliver a fast, strong technique. I have been there, trying to produce the same amount of power, but the more effort I put into it, the less effective it seems to be. How can they make it seem so effortless? I found myself saying… But that is it! Less "effort", less tension is what produces the increased power and snap of their techniques. Please try this exercise. Stand with your arms outstretched, shoulder blades back, chest open and upper body completely relaxed. Now, with your pectoral muscles, pull your arms in, so they wrap around your body. However, this is just a fast, snapping exercise. The idea is not to hug yourself and keep hold of your body. The idea is to snap your arms into your body, only to allow them to return (not force them to return) back to the start point. Try this exercise repeatedly, only concentrating on the initial "snap" of the pectoral muscles which bring the shoulder blades forward. If you huge yourself (depending on your flexibility) you will probably be able to get your hands to your shoulder blades. However, if you snap, the relaxed arms/hands will travel farther and faster, with your hands momentarily making it farther around you back. This is how you should execute gedan bari. From a yoi position, try moving into gedan bari. However, this time instead of stopping at the preparation point, try to recreate this snap feeling. Of course, the preparation is different from hugging yourself, however, the initial snap and the bringing forward of the shoulder blades is exactly the same. Also, if you are relaxed, you will find that the hand makes is much farther back and goes beyond the ear. Keeping the shoulders and arms completely relaxed (only using the pectorals to prepare) allows you to move in a smooth, unstilted manner. Plus, if you are relaxed enough, your arms will snap back (just like your leg in mae geri). As it snaps back, you will be moving into stance and as you finish your technique then you add the split second of kime (tension) to produce the final power of the technique. As beginners it is very difficult to make power with karate techniques. The movements are unusual and clumsy. We are learning to use our bodies in ways that don't make sense. As a result, many people tense their bodies as it is a natural/unlearnt way of creating power. It feels strong and initially produces results. 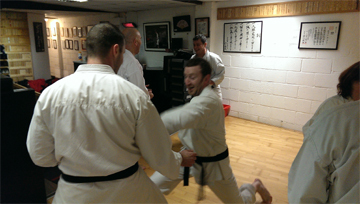 However, as a result, this over tension of the body always stifles power when the karate movements are learnt. If you try these two ways of training and compare the tense, two-part movement of the "western" style to the constant fluid action of the "Japanese" style, it becomes obvious that the latter style is superior. We can then take this principle and apply it to all our techniques. The basic blocks divide into two categories. Out to in (e.g. age uke and soto uke) and in to out (e.g. gedan bari and uchi uke). An exercise for the in to out category is the one described above, and for the other category you can practise the opposite. Start with your arms hugging yourself and shoulder blades forward. Concentrating on the back muscles, snap you shoulder blades back and elbows to the side like yoko empi (don't allow your arms to become outstretched, you don't want to cause hyper-extension). As they reach their apex, allow the snap to bring them back to the hugging position. There are two further points I would like to make before I conclude this article. The point about the age uke preparation is vital to understand how the relaxed use of the shoulder snap can be used for punching. Just because the hand does not move, does not mean that the same body mechanics mentioned above do not come into play. If we consider oi tsuki, when stepping forward the arm that will deliver the punch does not move. However, the snap of the shoulder should still be used to create a relaxed, fast punch. If you just rely on the arm muscles to force the arm forward it will produce a slow, stifled weak thrust, not a snap. Secondly, the shoulder is a ball and socket joint. So too is the hip. Although the exercises I have mentioned above would not apply to the hip, the hip can be used in a similar way. If you combine the snap of the shoulder with the snap of the hip, it will produce far more power than the forced, stifled approach of the "western" style. I would like to conclude by going back to Bruce Lee. I agree with him, I think Kung Fu (from what I have seen) is like an iron bar attached to a chain. It has that fluid, non-fixed form to it that is so alien to karateka. However, he is wrong about the "iron bar-karate". Good karate should never be stiff; although it does have more form than kung fu. Therefore, I prefer to think of karate as a flexible piece of steel. If you imagine a piece of steel that has been securely anchored at one end with the other end pulled back to its maximum apex: the power that is required is in the pull back. This produces potential power, which is released when the steel is freed and is snapped forward. Because there is no tension on the release, there is no blockage of power. Karate is exactly the same. We always maintain our form, but within that movement, we use the body to snap our techniques into place and use kime to finalise the movement. Another excellent article by a thoughtful, innovative teacher who has trained in the deep traditions of his art. 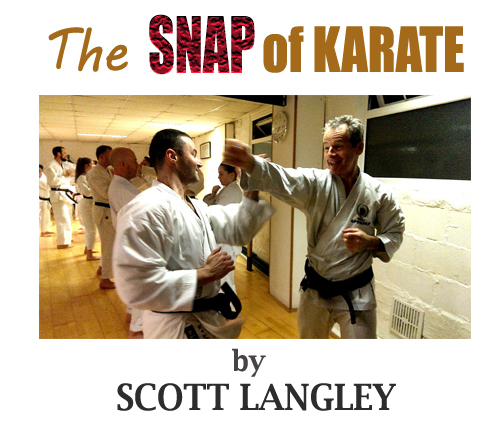 Scott Langley has conducted seminars across the world. And if you reside in Ireland, I urge you to visit his Hombu Dojo.